PASADENA, CALIF. (AP) — A low-budget anti-Muslim film that sparked violence in the Middle East and death threats to the actors involved was compared with the likes of "Titanic" and "The Lord of the Rings" in a federal appeals court Monday. 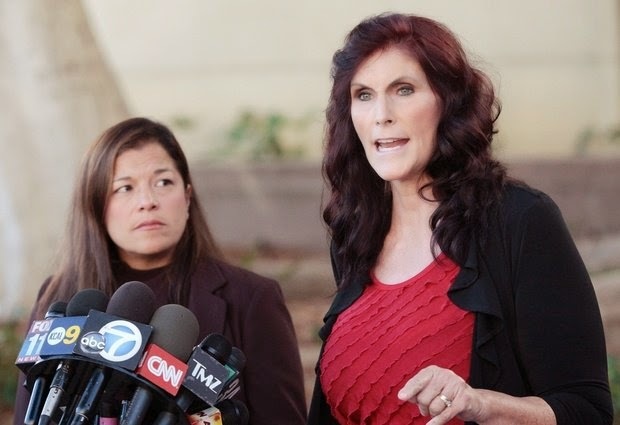 A lawyer for Google argued that if a ruling stands allowing a bit player in "Innocence of Muslims" copyright privileges, it could extend to minor characters in blockbusters, shatter copyright law and ultimately restrict free speech because anyone unhappy with their performance could have it removed from the Internet. "The ultimate effect is to harm the marketplace of speech," attorney Neal Katyal told a 10-judge panel of the 9th U.S. Circuit Court of Appeals. Chief Judge Sidney Thomas said the court would rule later on Google's request to reverse a decision forcing YouTube to take down the film that inspired rioting by those who considered it blasphemous to the Prophet Muhammad. A divided three-judge panel of the court ruled in February that actress Cindy Lee Garcia had a copyright claim to the 2012 video because she believed she was acting in a much different production than the one that appeared. Cris Armenta, a lawyer for Garcia, said the extraordinary circumstances justified the extreme action of a court injunction against YouTube. "She is under threat of death if she is not successful in removing it," Armenta said. Judges peppered the lawyers with questions mostly focused on copyright law and how Garcia's performance compared to those of other actors and musicians. Google was joined by an unusual alliance of filmmakers, other Internet companies and prominent news media organizations that don't want the court to alter copyright law or infringe on First Amendment rights. If the court upholds the smaller panel's ruling, YouTube and other Internet companies could be besieged with takedown notices, though it could be hard to contain the film that is still found online. Katyal said 300 hours of content is uploaded to YouTube every minute. "Is there anyone in the world who doesn't know your client is associated with this movie?" Judge Richard Clifton asked Armenta. Google had argued that the copyright was owned by filmmaker Mark Basseley Youssef, who wrote the script, managed the production and dubbed over Garcia's dialogue. A dissenting judge in the 2-1 decision said Garcia played no creative role that would give her ownership rights. Until the court order, YouTube had rejected calls by President Barack Obama and other world leaders to pull the video, arguing that it would amount to government censorship and violate free speech protections. Garcia has support from the Screen Actors Guild and the American Federation of Musicians. Alex Lawrence, a copyright and intellectual property lawyer in New York not connected with the case, said he thinks the court will reverse the earlier ruling because the judges reached a decision to give Garcia some relief on thinly grounded law. "There's a lot of sympathy for Miss Garcia," Lawrence said. "She got paid $500 and received death threats. Everyone feels sympathy for her, but using copyright in this way is a real problem for a lot of industries." Armenta said that every actor in battle scenes in "The Lord of the Rings" has a copyright claim as do the oarsmen rowing the lifeboats in "Titanic." That's exactly the scenario Katyal argued against, saying it would fragment copyright into 1,000 possible claims. "There is zero precedent that a work can be splintered and fragmented," Katyal said. "It will cause untold mischief." The film drew the attention of federal prosecutors, who discovered that Youssef had used several false names in violation of probation from a 2010 check fraud case. He was sent back to prison in 2012 and was released on probation in September 2013.